I know, I know, I’m late to the crafting Christmas party. Last night I started on the first Christmas present (a crochet mermaid tail blanket) and today when I took the children to the library I took out a Christmas craft book for me to peruse. The mermaid tail is worked from the bottom up and I’ve made it up to the part where the shells begin. I got further than this earlier but hated the shells so I frogged it back to the treble crochet rounds. The shells just looked scruffy and cramped, so whilst tea was cooking I watched some YouTube videos about how to crochet them. I decided to go for a pattern that used less stitches per shell, and it had an odd number of stitches so didn’t need a chain in the middle of the shell. I’m much happier with the result so far, particularly how the stitches lie. The blanket pattern is from Etsy and is a fab pattern, I just couldn’t get on with the shells in it. I love the tail though and I’m looking forward to making it. I used Bella Coco’s shell tutorial instead, and the whole thing is made using Ice Yarns Magic Lights. My chevron blanket made using the same yarn isn’t finished but I’m working on both at the same time for now in the hope that I will not lose interest in either. The fact the mermaid tail is a gift should keep me going too! As well as the crochet gifts, I’m aiming to make at least some Christmas cards this year too. I have far too many Christmas cardmaking kits and so on and I feel I ought to use them. If I don’t use them this year I think I make just have to sell them all on eBay as they are taking up valuable space. For the sake of the poor abandoned Christmas card things in the cupboard keep your fingers crossed that I get some cardmaking mojo very soon! Have you started crafting for Christmas? What are you making? Have you got a list or are you winging it? Good on you for getting started on handmade Christmas gifts…very organised there! 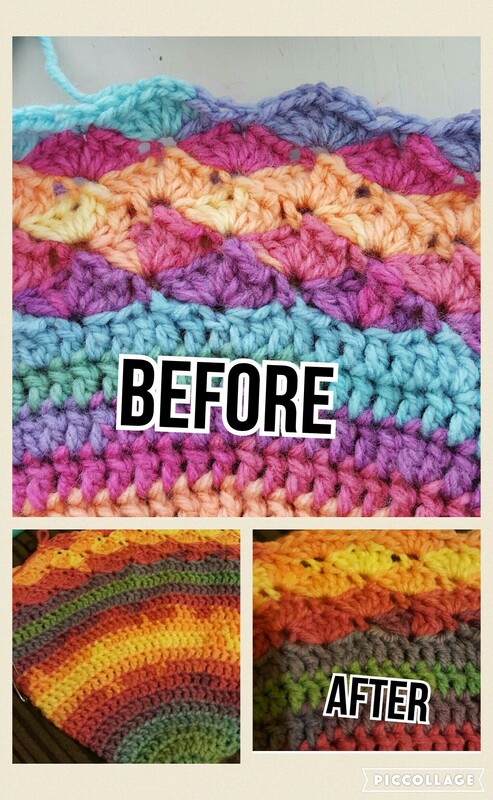 I love those mermaid tail blankets and I look forward to seeing yours progress. just beautiful! I am thinking about Christmas too! There has been some list making here and a bit of crafting, however I never know who actually reads my blog or gets on my computer so it is remaining largely secret for now. I love your projects and handmade cards sound so personal. Luckily this gift is for a child, though whether I post a finished photo before christmas is a different matter lol. My list keeps getting longer, I think some of the things may have to keep for birthdays or next Christmas! Christmas???? Oh my word I’d forgotten about that. Well done for starting, perhaps it will motivate the rest of us! Haha, I’m not sure I’ll get everything done. I still have the boring job of sewing name tags into my little boy’s school uniform to do. Oh dear I remember it well. Pity there’s not a crochet pattern for that! You’re so much on top of things! I haven’t even thought about what I’m going to gift for Christmas this year. I guess I really need to have a big think about it! Mermaid tail sounds like my favorite adult stuff. And mermaids got magical powers!